My Top loyalty program for regular clients, guarantees additional discount based on the number of the bookings you have made on our website. The amount of the discount vary between 3 and 15% (in addition to our online discount). Becoming a loyal client gives you not just price preferences, but other benefits too! When you’ve made your first booking into our website you’ll get automatically Bronze account. That means 3% off from the total car price of your next booking. 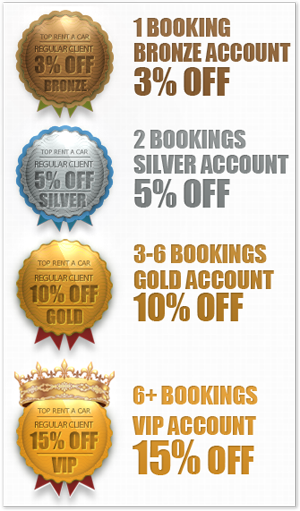 Having two bookings on your account it becomes Silver – 5% off. So you’ll get this discount on your next booking. 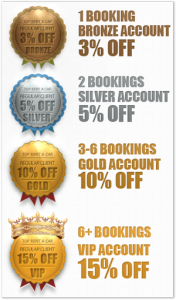 3-6 bookings makes the account Golden – 10 % off. Our VIP customers gets the most preferences. VIP customers are those who have got more than 6 bookings. They’ll get additional 15% off from the total price of the car and our online discount of course. Stay tuned with our latest newsletters which gives you more special coupons and become a fan in our Facebook page if you didn’t yet.